Cities are coming into ever sharper focus as potential engines for growth. There is also recognition of the vital role good transport links will need to play if we are to see the kind of economic success of London replicated in other cities across the UK. A key conclusion of the One North report was the need to create a larger and more effective commuting potential for cities outside London, and that more effective integration of these cities needs to be a priority. Recent announcements on HS3, creating a northern powerhouse and Transport for the North, demonstrate that there is now real momentum for this agenda. These are undoubtedly very positive developments. But if we are to rebalance the economy we need to see as much focus on better connectivity within as well as between city regions. In fact it could be argued that the potential agglomeration benefits are greatest within regions themselves. Congestion is a serious constraint on growth. Not only does it slow down travel time and result in lost productivity, but it also limits the potential for agglomeration impacts that arise from increased proximity and connectivity. This is why congestion in urban centres is so damaging to prospects for sustained economic growth. And all the forecasts suggests that this trend is set to get worse. A recent report by the Centre for Economics and Business Research estimates that British business will lose £300 billion to gridlock over the next 16 years. Buses are key to reducing traffic congestion and also require lower levels of capital investment than other solutions. 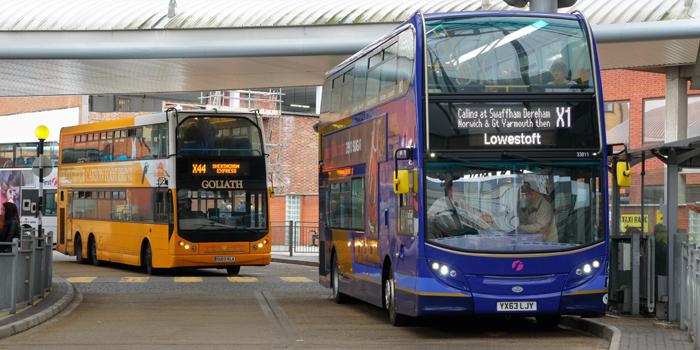 KPMG have estimated that targeted investment in local bus infrastructure and selective priority measures will typically generate £3.32 of net economic benefit for each £1 of cost incurred. The increased focus on stimulating local economies, means buses ought to feature prominently in Strategic Economic Plans. A vast body of evidence has been gathered in last few years demonstrating the vital role that buses play in supporting employment, retail and businesses. For example the bus is the main mode of access to city centres and responsible for 29% of city centre expenditure. However, recognition of the contribution the bus makes to local economies is very low. And there is the real risk that essential bus infrastructure spend could suffer through the devolution of capital spend to the Local Growth Fund. We already have evidence of this in the first round of Growth Deals. In 2013 bus projects made up a much smaller proportion of the total than in the final group of directly Government-funded schemes approved in late 2011. What is currently missing is both recognition of the role buses play and guidance as to how to capitalize on this. This is why Greener Journeys is calling for a National Statement on Local Bus Infrastructure (NSLBI). This should have three specific objectives: to encourage decision-makers to invest in local bus infrastructure; to provide evidence on best practice; and to promote greater partnership working between LEPs, local authorities, bus operators and bus user groups. As a minimum, such a statement should provide guidance on best practice, with a commitment to provide professional support to those wishing to develop public transport networks. We would also envisage that financial support would be available for innovative schemes for the design, delivery and management of bus-related infrastructure. We also propose that the NSLBI should encourage local decision-makers to commit to long term programmes of investment in bus infrastructure as part of local transport plans. Growth Deal awards should be linked to the quality of the Strategic Economic Plans, and these should have a supporting Local Transport Plan. The way in which the London Mayor’s Economic Development Strategy is linked to the Mayor’s Transport Strategy provides a useful model. Such a change would ensure that the criteria for assessing Strategic Economic Plans and the case for funding were aligned to the objectives set out by the Secretary of State in the NSLBI. We also believe that the DfT should revisit its guidance on the development and use of Local Transport Plans under devolved decision-making. The current status and application of the guidance is unclear and it may be a useful mechanism to ensure that local decision-makers consider transport solutions as a whole. Transport is simply too important to meeting economic, social and environmental objectives to be wrapped up as part of a broader Strategic Economic Plan. Our proposal would ensure that objectives and strategies for improving local bus services would be determined locally, while being aligned to Strategic Economic Plans, and guided by national policy. If we want to see more engines for growth across the UK the role of the bus in supporting local economies must be maximised. A National Statement on Local Bus Infrastructure would ensure that local decision makers are empowered to seize this opportunity.